By employing advanced monolithic designs and simplified packaging methodologies, SANA has unmatched technical strengths and experiences in producing Power Amplifier Modules in reduced sizes for 3G/4G applications. As a family of fully matched 10-pin surface-mount 3 mm x 3 mm modules, the S32xx Power Amplifier Modules cover majority of LTE, WCDMA and CDMA bands. 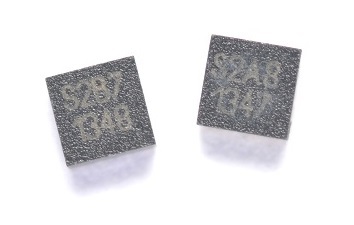 The S2xx Power Amplifier Modules for 3G and LTE come in with an exceptionally small form factor (2 mm x 2 mm x 0.9 mm). These modules are all based on monolithic single die designs with no surface-mount devices inside the module. 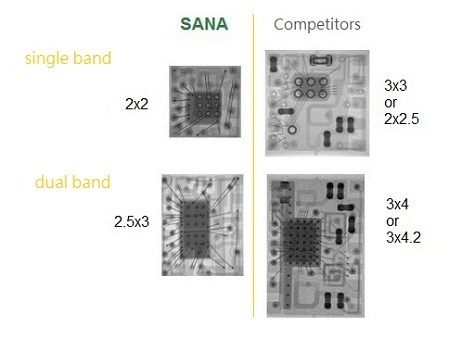 SANA has produced the world’s smallest Power Amplifier Modules (PAMs) for CDMA, WCDMA and LTE smartphones, tablets and other wireless gadgets in three categories, driving down the size, weight and cost of the devices for manufacturers. In the single band category, SANA’s 2 mm x 2 mm PAMs are 56% smaller than the 3 mm x 3 mm PAMs commonly available in the market. Its 2.5 mm x 3 mm PAMs also outdo all competitors in terms of size in the dual band and quad band categories. The SANA 2.5 mm x 3 mm PAMs further surpass the competitors by using a single socket and form factor for single, dual, triple and quad bands. SANA proudly presents its S2XX series, the world’s smallest Power Amplifier Modules (PAMs) by the form factor of 2 mm x 2 mm. The innovative PAMs in the line are fully matched surface-mount modules and are monolithic single die designs with no surface-mount device.